Rachel Hannagan became the South East Regional U/15 all rounder Champion at Guildford on Sunday. 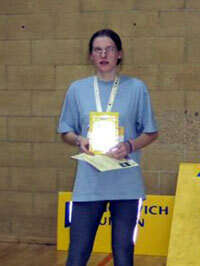 She will go to Birmingham on the 22nd April to represent the South East at the National Sportshall Final. Hannah Tolhurst won a Silver medal in the Vertical Jump 64cm. Hannah Ridge won a Sliver medal in the Speed Bounce 78 bounces. A total of 17 medals were won on Sunday. Well done to Rachel Hannagan for winning the U/15 Girls all rounder event. Thanks to everyone who took part on Sunday in a very high standard of competition.